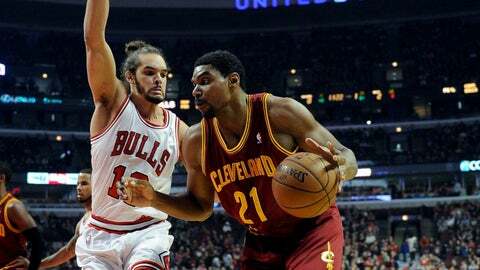 Cleveland Cavaliers center Andrew Bynum (21) is defended by Chicago Bulls center Joakim Noah (13) during the first quarter at the United Center. CHICAGO (AP) — D.J. Augustin came into the league with high expectations. He came to Chicago simply looking for another chance. Augustin delivered on Saturday, scoring 18 points to help the short-handed Bulls beat the Cleveland Cavaliers 100-84 and snap a four-game losing streak. Carlos Boozer led the way with 19 points, and rookie Tony Snell came on strong in the second half to finish with 17 points. Chicago prevailed after matching its longest slide of the season and its longest in four years under coach Tom Thibodeau. "As we get bodies back, D.J. gets comfortable, I said all along that I have great belief in this team," Thibodeau said. Augustin looked like a guy who’s settling in. He played more than 46 minutes, hitting 4 of 6 3-pointers while dishing out 10 assists. He did commit five turnovers. But overall it was a good night for a former first-round draft pick whose career hasn’t quite gone the way he hoped. Augustin found himself in a limited role with Indiana last season after spending his first four years in Charlotte, and he was waived by Toronto this year before being signed by the Bulls last week. "The Indiana situation, I had some good games there," Augustin said. "At the same time, it was tough. The style of play maybe didn’t fit me a little bit. Coach (Frank) Vogel had his guy that he went with, he played the majority of the minutes. I kind of knew that going in. The Toronto situation, I don’t know what happened there. But I just tried to stay professional and just keep myself ready." Boozer and Augustin both got off to strong starts as the Bulls built a 17-point halftime lead, and Chicago withstood several pushes down the stretch to come away with the win after dropping 13 of 16. The Bulls shot nearly 54 percent overall and were 10 of 15 on 3-pointers against a weak defense. Boozer hit 8 of 14 shots. Snell nailed five 3s — four in the second half — and finished one point off his career high. Taj Gibson scored 15 points. Joakim Noah grabbed 18 rebounds, and Chicago got a reprieve from the losing despite all its injuries. Besides Derrick Rose, the Bulls were also missing the injured Luol Deng (sore left Achilles), Jimmy Butler (sprained right ankle) and Kirk Hinrich (back). But they still had enough to beat Cleveland. "There were a lot of things I saw our team do that you just kind of sit back and go, `Is this really us?’" coach Mike Brown said. Andrew Bynum had 19 points for the Cavaliers, but Kyrie Irving had a rough night. He finished with 14 points on 5-of-16 shooting after fighting through an illness to score 39 in Friday’s overtime win over Milwaukee, and the Cavaliers lost for the third time in four games. It didn’t help that they were missing second-leading scorer Dion Waiters, who sat out his second straight game because of a sore right wrist. "There’s no excuses, we just didn’t execute on both ends of the floor," Irving said. The Bulls saw a 19-point lead early in the third shrink to 68-61 late in the quarter. But a basket by Gibson and back-to-back 3-pointers by Snell bumped the lead to 81-65. The Cavaliers made another run in the fourth, cutting their deficit to 85-76 on Matthew Dellavedova’s 3, but Chicago hung on. NOTES: Brown expressed sympathy for Kobe Bryant over the Lakers star’s most recent injury. "You feel bad for him because of how hard he works, how bad he wants it," Brown said. "To see him go through the last two injuries, especially at this point of his career, makes it tough, makes it tough, so you feel bad for him." Brown was fired by the Lakers early last season and returned to Cleveland for a second tenure in April. … No. 1 draft pick Anthony Bennett sat out his second straight game for Cleveland because of an illness. … Deng, averaging 19.6 points, missed his second straight game for Chicago because of a sore left Achilles tendon. Butler left Thursday’s game at Oklahoma City because of a sprained right ankle. The Bulls were hoping Hinrich would return from an ailing back against Cleveland. Instead, he missed his fifth straight game.